The range of skiing activities has never been so expansive: Winter sports enthusiasts can choose from all sorts of innovative and traditional activities, including carving, freeskiing, ski touring and Alpine skiing. Each of these activities will be brought together in one special skiing hall at ISPO Munich (February 3–6, 2019). Exhibitors representing the leading ski brands will have the best conditions to display their solutions. Professional visitors will profit from the central hub for the entire skiing portfolio. Through the integration of the ski hall (Hall B5) in the Snowsports segment (Halls B2—B6), all information for the winter sports season will be ideally presented for sports business professionals. The new ski hall will pay off not just for sporting goods retailers. Representatives of winter sports regions will also find the entire range of information about the new season and beyond here. Enthusiasm for winter sports remains unbroken. Around 15 million people in Germany go skiing and snowboarding. Nearly 75 percent of skiers own all or some of the equipment they use on the slopes. More than 540,000 winter sports enthusiasts are members of the German Ski Association. Trendsetters continuously come up with new ideas that excite friends of winter sport and create a successive intake. ISPO Munich remains true to a tradition that stretches back nearly 50 years. In 2019, skiing remains one of the main elements of the world’s largest trade fair for the sport business. The hall concept that was expanded in 2018 has been extended further with the addition of a new highlight in the redesigned Hall B5. The trade fair hall with the wide central aisle was developed together with the industry. “We are excited to be a part of creating the new B5 Ski hub. We were engaged with our ski industry colleagues and the ISPO Munich team to pursue a new and dynamic gathering place for the ski retail community. 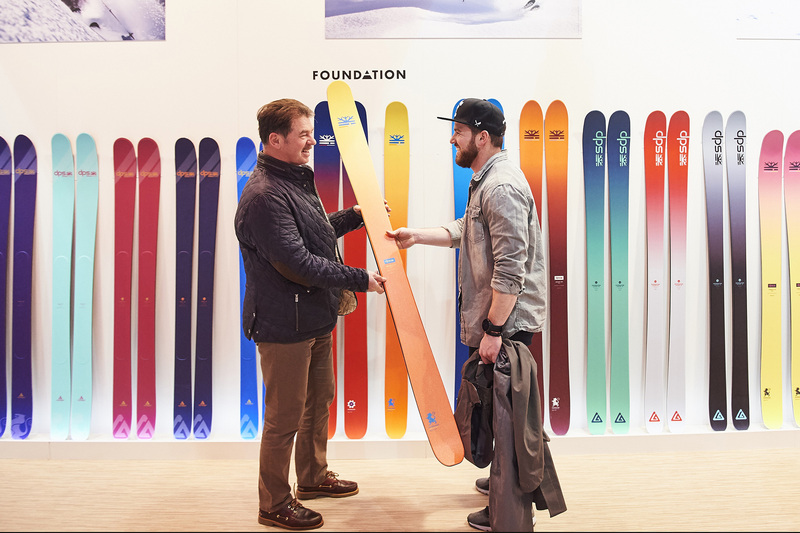 This new concept should create a place with shared topic spaces like the exciting new GripWalk initiative, the major ski brand presentations and a single hall concentrating on the ski hardware market. We expect a higher focus from the visitors and an area to build the ski community: suppliers, retailers, service suppliers and press. All working together with a common purpose: growing the ski market”, says Jonathan Wiant, President Marker Dalbello Völkl Brands. The hall creates an inviting and inspiring atmosphere for professional visitors. Focus areas set up in the middle provide exhibitors with special display opportunities where they can showcase their trends and innovations. Lounges, conference areas and meeting rooms serve as the ideal place to get away from the bustle of the trade fair and chat with customers or network. This area will pay off not just for manufacturers, sporting goods retailers and trade association officials. Representatives of winter sports regions will also find the entire range of information about the new season and beyond here. Hall B5 will bring the industry’s key players together under one roof—the exhibitors who will display their highlights for such trend themes as mass customization (customizable products) will include Blizzard, Fischer, Head, Leki, K2, Nordica, Tecnica and Völkl. The winners of the coveted ISPO Award will show off their innovations as well. In short, ISPO Munich is the optimal platform for all innovations in the skiing industry. One other highlight: In the focus area called “Heroes of Snowsport,” visitors will take a journey through the history of skiing. By integrating the “ski hall” into the Snowsports segment, ISPO Munich will link all winter sports elements in five halls (B2-B6) and showcase the entire winter sports portfolio. Among other things, the XC Village in Hall B6 is the meeting place for the cross-country skiing community. From skis and snowboards to clothing and accessory trends and winter sports safety, ISPO Munich will highlight the latest trends and innovations for sport business professionals.